If you are a business owner or manager and you use emails to advertise, connect with prospects or send updates to clients or residents, this is important information for you. Canada's attempt to protect its citizens from unsolicited messages. 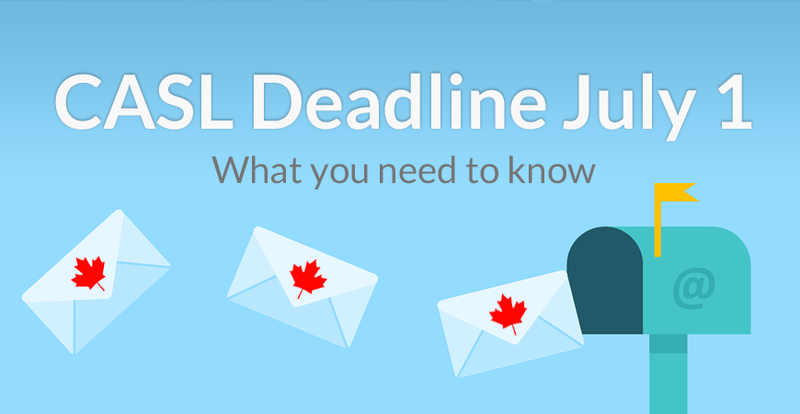 CASL is an opt-in law, meaning that any businesses operating within and/or selling to Canada, are only allowed to send email to people who've agreed to receive messages from them. This affects all commercial electronic messages (CEMs) regardless of distribution method. Which is basically, any communication where the content and intent of a message is for selling purposes. Regardless, of the number of recipients; even one-on-one emails. Express consent means that a person has clearly agreed (orally or in writing) to receive email from you. Express consent does not expire until consent is revoked (via unsubscribing). Implied consent can be gained through certain activities such as making a purchase or inquiring about a company's services. If someone makes a purchase, the implied consent is valid for 2 years. If someone inquires about a product or service, the consent is valid for only 6 months. If the subscriber hasn't "renewed" their implicit consent during that time frame, for example, making another purchase, the implied consent expires. This means that when a prospect makes an inquiry on your website or your advertising, you have 6 months where you are legally allowed to send this person sales and marketing communications. These rules only affects contacts located within Canada. First introduced in 2010, July 1, 2017 marks the date the law will be fully implemented after a long grace period for implementation and transition. The transition period for implied consent to receiving commercial electronic messages ends. All implied consents now have an expiry date. Three government agencies have their hand in enforcement. The Canadian Radio-television and Telecommunications Commission (CRTC), Competition Bureau and the Office of the Privacy Commissioner. Even though it's a Canadian law, it doesn't only apply to Canadians, but to all senders that send emails to recipients based in Canada. CRTC works with international counterparts to investigate international senders. There is a lot more information regarding CASL. If you're someone who sends out email campaigns or sales emails, and you haven't already familiarized yourself with CASL regulations I encourage you to do so. Here is a short article that explains CASL in more detail, and what you need to know. If you find official government documents to be more enjoyable to read, check out their consent guidelines, or read the full law!